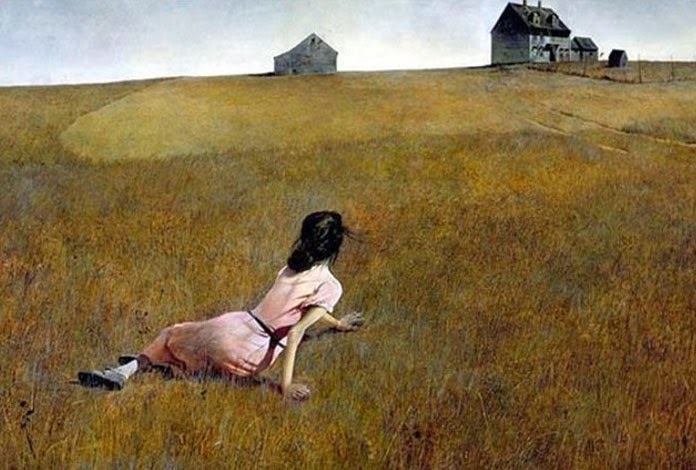 My painting called "Lost Traditions" was inspired by "Christina's World" painted by Andrew Wyeth. I found this painting to be extremely fascinating, not only by Andrew's refined technical skill, but also by the meaning behind his work. Andrew was inspired to create "Christina's World" after viewing his neighbor dragging herself towards her home. Christina, Andrew's neighbor suffered from polio and as a result she was paralyzed from the waste down. The distortion in Christina's torso and the composition immediately grabbed my attention. This inspired me to use a similar composition. Instead of Christina's home I placed the Cotopaxi stratovolcano from Ecuador in the top right corner of my painting. I also replaced the barn for the sun and my made my painting vertical instead of horizontal. The object that I chose for my painting was an item purchased in a city next to Machu Picchu, Peru. I placed this item on the bottom left corner. Instead of painting both bulls facing forward, I painted them facing in opposite directions in order to capture the distortion of Christina's torso. This is the image that I used for "Lost Traditions". 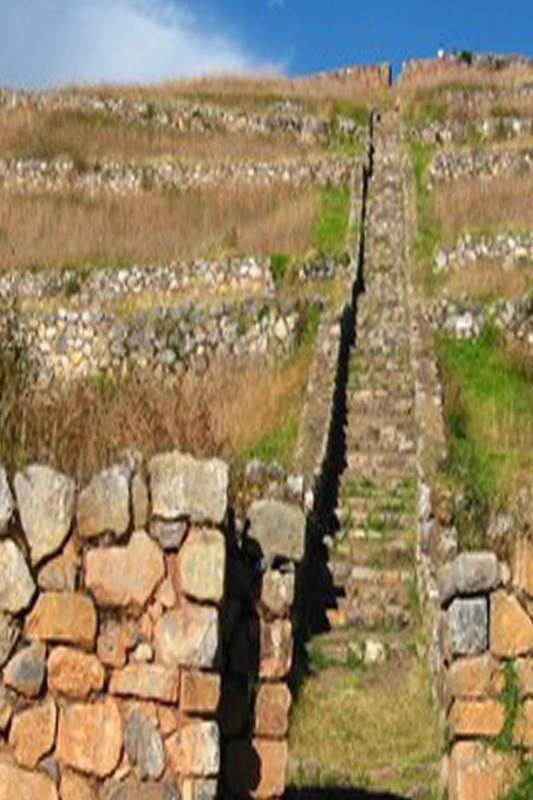 It depicts ruins in Peru. I incorporated the path and some of the rock walls. My original idea for this painting was to have water reflections meshing into the Cotopaxi stratovolcano, but my visions sounded and looked better in my mind. The perspective was not working for me. With this in mind, I looked outward and found a beautiful photo of the Peruvian ruins. I used titanium white to cover the strong violet lines. 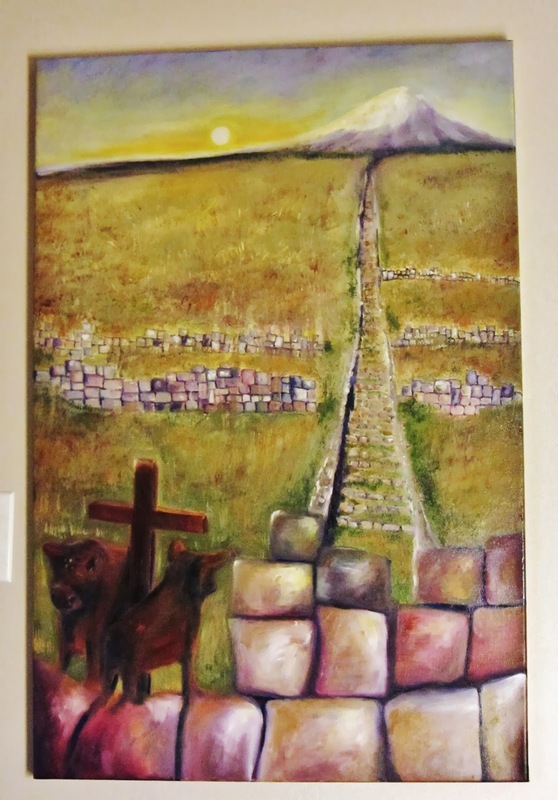 Instead of the water, I painted beautiful stone walls surrounded by drying grass. I layered the grass with various colors using galkyde and several techniques. I especially used the sgraffito method for the grass. The detail is much better in person;). This is the final piece. Although my original idea did not come through the final result, it is better than what I imagines it to be. This painting has been submitted to the 2014 Annual Student Art Show. It is a juried art show with prizes. Hopefully it is chosen:).